Leigh Hobbs is the bestselling author of more than 20 books, including the iconic Old Tom, Mr Chicken goes to Paris and Horrible Harriet. As an artist, he works across a range of mediums, as well as writing and illustrating his children's books. Mr Chicken goes to Paris was shortlisted for the 2010 Prime Minister's Literary awards and has been a constant best seller at the Louvre Museum Bookshop in Paris. Old Tom has been adapted into an extremely popular TV series. Leigh Hobbs was the Australian Children's Laureate for 2016-17. His subversive humour has delighted children for more than two decades. What’s next when the fun and focus of Book Week is over? A new Mr Chicken adventure of course!! With his insatiable appetite for travel, Mr Chicken, Citizen of the World, takes us on his latest exploits. This time he is in Rome and from endpaper to endpaper it is a feast of fun. 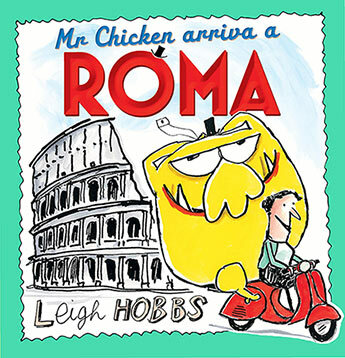 Armed with his Very Frequent Flyer card, a list of things to see and some handy phrases, Mr Chicken arrives in Rome keen to explore his childhood dreams of Ancient Roman life and places. With his guide Federica he’s off to see some ruins and meet some real Romans, although the departing view of him on Federica’s Vespa is a bit disturbing and is one of those things that can never be unseen! Luckily his nightmare is interrupted by the return of Federica who is taking him to her family for dinner. 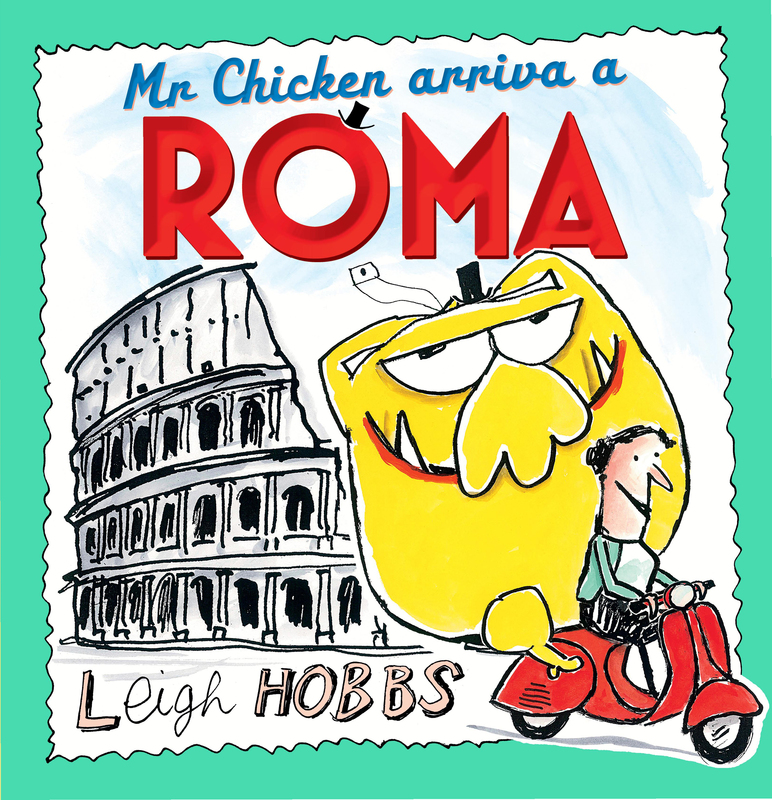 This time Mr Chicken is in charge of the Vespa and brings a whole new meaning to the madness of traffic in Rome. But all too soon it is time to say “Arrivederci” to this fascinating place and create an album of all those selfies he took. In his iconic style that is so familiar to younger readers, Leigh Hobbs has once again created the most enjoyable ‘travelogue’ of one of the world’s greatest cities and as well as offering a wonderful adventure with the indomitable Mr Chicken that children will love, he’s also provided a terrific teaching tool to show our youngest students that there is a world beyond their town. Some of the best lessons I’ve ever given have focused on Mr Chicken’s adventures as we’ve read the books, used Google Earth to explore each city and its significant places and then wound up with examining our local community for the places Mr Chicken would have to see if he came to our town. Superb for exploring built and manmade features, discussing those things that are unique to the area and getting the children to not only discover their surroundings but also draw them and tell their stories. So if you’re concerned that the spotlight on the library will fade soon, Leigh Hobbs and Mr Chicken are guaranteed to turn it back to full beam. Ben venuto caro Signore Pollo! Mi sei mancato! Everyone’s favourite fowl, renowned for his international travel, is back to give us true insight into another marvellous metropolis. Mr Chicken has graced both Paris and London and shown us all their special sights and highlights. Now it’s the turn of the Eternal City, Roma. Of course with an Italian in residence (though he is Milanese!) this one has special resonance for us and we have been waiting patiently (no, that’s not true – we’ve been waiting impatiently!). I’m totally envious as Italy has always been one of my dream destinations (and never likely to get there sadly), however I can at least enjoy it vicariously through Mr Chicken’s Roman holiday. From the Vatican City (surprised that Mr Chicken didn’t make it the balcony with HH) to the Trevi Fountain, our avian friend explores the city with his friend Federica aboard her trusty Vespa. Along the way he relishes not only the spectacular sights but the gastronomic delights – hmmmm, pasta galore, gelati (but no canoli – my favourite of all). Apart from the obvious humour these books are such a super way to introduce young humans to other cities and cultures. My Preppies have had great fun the last couple of weeks after we shared the previous two and I asked them to predict the cover of the new book for their Book Week competition. It led to some serious discussion about what they already knew about Italy (pizza and pasta hahaha!) and some sharing of simple information books to help them picture Mr Chicken’s arrival. There is no need to give this book the big hype – Leigh Hobbs’ work needs absolutely no ‘hard sell’. I know everyone will be rushing to get this into their collection – however, my most sincere ‘highly recommended’ comes with this review.